The popular measure was overwhelmingly backed during a debate in the Senedd yesterday afternoon, Assembly Members joining the call from Animal Defenders International (ADI) for urgent action to bring in the ban without delay. The debate was proposed by the Petitions Committee in January following the presentation of a petition signed by more than 6,000 people wanting a ban and supported by ADI. A ban on the use of wild animals in travelling circuses has already been passed in Scotland and Ireland, while in England the UK Government recently indicated legislation to prohibit such acts will come into effect by January 2020. 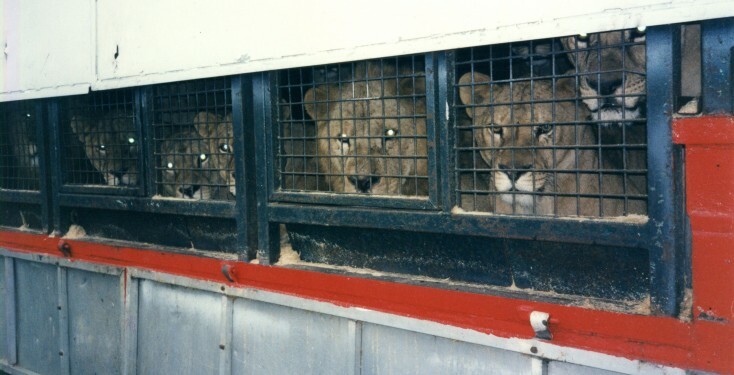 ADI’s investigations have recorded life for the Chipperfield big cats in Staffordshire where for at least four years, they have lived mainly confined in cages on the back of a truck with restricted access to an exercise area. Thomas Chipperfield has announced plans to tour, which could bring this unwanted act back to Wales. If you live in Wales, please urge your AM to press for the ban today! A second reading of the bill to ban wild animal acts in England is scheduled for 16 March – urge your MP to support it. Animals do not belong trapped in cages and forced to perform! This is cruel and outdated! Because the time has gone when animals should be exploited in this inhuman way. We cannot plead ignorant of the fact ……all animals suffer in this cruel and deprived existence. The world is changing and I would like to see Wales as being one of the leaders in this change.